Here’s a sample rubric for good sportsmanship. I do use that term, even with kindergartners, because I figure they might as well start off learning terminology that we’ll continue to use in the future. When teaching kids how to join in a game, we do a lot of videotaped rehearsals and practice with puppets and peers. Most of my kiddos hate to lose (me, too!) so I give them opportunities to win games and then gradually wean them off victory into the “real” world. They enjoy hearing how I used to cheat my sister at Monopoly (“Oh, my teacher is human!”) and I emphasize candor as we navigate the winning and losing issues. Obviously, some rubrics for good sportsmanship will have a greater focus on simply joining in, because some kids are at a loss during recess. Other kids need more emphasis on playing fair or managing their feelings if they lose a game. The best rubrics are individualized and supported by direct instruction. 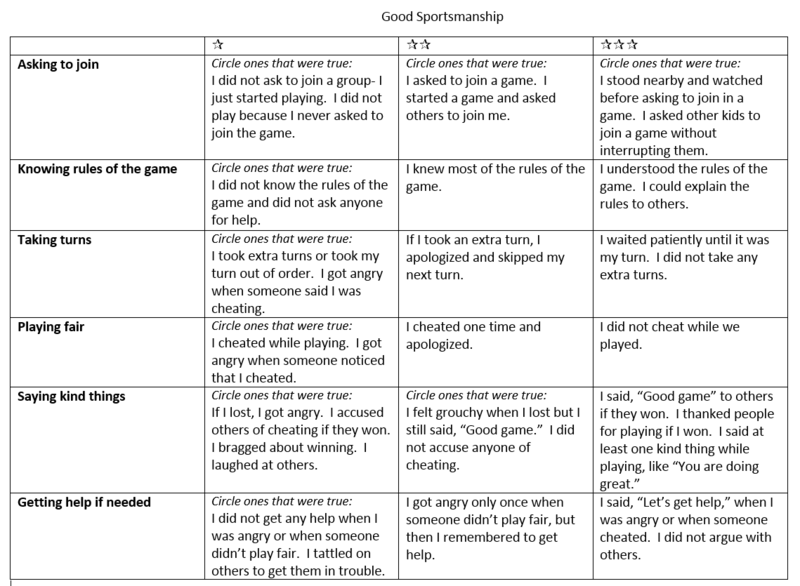 Posted on January 24, 2015 by teachezwell	• This entry was posted in Rubrics and tagged rubric for good sportsmanship, teaching social skills. Bookmark the permalink. 3) Students develop social skills that allow successful sportsmanship, teamwork, and communication through physical activity. 3a. Solve simple movement challenges individually and with a partner. 3b. Demonstrate a willingness to work with anyone in class. 3c. Demonstrate cooperation by taking turns, sharing, and giving encouragement to others. 3a. Solve movement challenges in small groups. 3b. Demonstrate understanding of fair play. 3c. Demonstrate respect for others through verbal and nonverbal communication. 3a.Demonstrate responsibility for following game rules without direct teacher supervision. 3b. Demonstrate cooperation by supporting and encouraging others of different abilities/skill levels. Yes, the key is developing these skills so they are used when no teacher is guiding them. Thanks for taking the time to share these objectives. I always appreciate you, Miran!